Serviceberry pudding captures the full flavor of the fruit. I love fruit puddings. They’re easy and quick to make. They don’t heat up the kitchen on a hot summer day. They don’t require a pie crust. And most importantly, fruit puddings deliver pure, concentrated fruit flavor. Serviceberry Pudding is a perfect early summer dessert. Feel free to use your thickener of choice; I’m fond of tapioca. Minute tapioca (aka instant or quick tapioca) lets you put this dessert together in less than 15 minutes. Wait another 20 for the pudding to set, and you’re ready to serve. Serviceberries have more integrity than many other fruits. They would never lie or cheat or steal. What I mean is they have more structural integrity than many other berries, because their skins are a little thicker than those of blueberries and bramble berries. Those berries quickly break down when heated, but Amelanchier berries retain their shape. An admirable quality in a pie, but I prefer my puddings to be smooth, which is why I purée the pudding before pouring it into individual dishes. If you substitute another fruit in this recipe, you can skip that part. In a saucepan, stir together the fruit, tapioca, milk, and sugar and let the mixture sit for five minutes. Bring the pudding to a simmer, stirring to prevent sticking, then remove the pan from the stove and pour the pudding immediately into a food processor or blender. Blend until smooth, then pour the mixture into individual bowls. 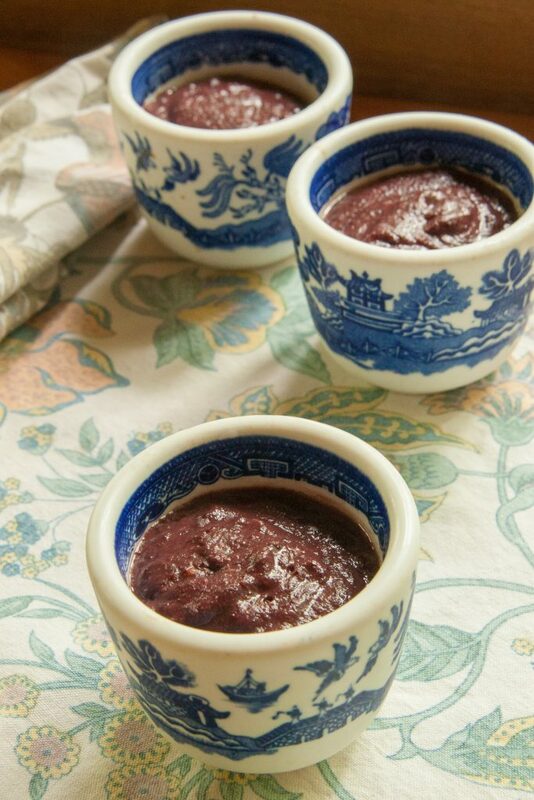 Let them sit for 20 minutes (this pudding sets quickly), then serve warm, or refrigerate and serve cool. Either way, it’s pure Serviceberry goodness.